Wing span: 1 1/2 - 2 inches (3.9 - 5.1 cm). Identification: Upperside is checkered black, orange-brown, and orange; hindwing has a dark wing base and a light median band. Underside of hindwing has pearly white spots. Life history: Males perch and sometimes patrol in gulches for females. Eggs are laid in batches on underside of host plant leaves and sometimes on flower buds. Caterpillars eat leaves and flowers, and feed together in groups. Third- and fourth-stage caterpillars hibernate under rocks; some diapause for months and maybe years to survive bad weather. Flight: Two broods from June-August. Caterpillar hosts: Rabbitbrush (Chrysothamnus viscidiflorus) and aster (Machaeranthera) in the sunflower family (Asteraceae). Habitat: Sagebrush scrub, pinyon-juniper woodlands, dry gulches. Range: Eastern North Dakota west to eastern Washington, south to New Mexico, southern Arizona, and eastern California. 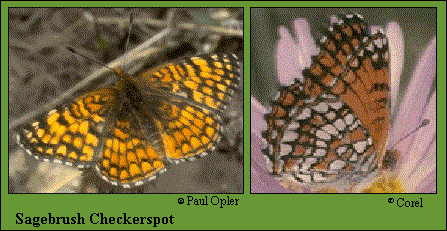 Note:This butterfly includes several subspecies including neomoegeni.